Lemniscate by Jennifer Murgia is the second book in the Angel Star series. See my review of book one: Angel Star. For Teagan, these last few months have been heaven on earth – especially now that Garreth, her boyfriend and guardian angel, is earthbound. But perhaps Garreth is becoming a little more human than either of them expected. 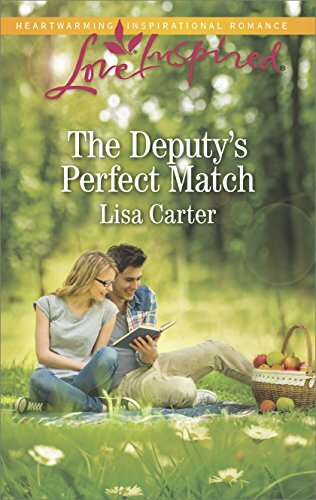 I enjoyed reading this second installment in the Angel Star series. Unlike the first book, Angel Star, Teagan learned to rely on herself instead of her angel. I loved seeing her strength and resolve grow through this new independence. In this second book, Teagan’s best friend is Ryan. Tea and Ryan have a lot of fun together. I enjoyed any scene with the two of them. Their banter and relationship was entertaining. I really liked Ryan. He sounded cute and trustworthy and . . . human. I kind of wish sometimes Teagan would hook up with him instead of Garreth. For me, Ryan is the Twilight’s Team Jacob equivalent. Oh Garreth, you made me angry during this book. I’m not sure if everyone would agree with me, and I don’t want to go into details. I believe in forgiveness, but I really think there should have been more of a discussion between him and Teagan over a few of his choices. Those of you who’ve read the book know what I’m talking about. But hey, no one likes a flawless character. A new character, Dr. Nathaniel Dean, was introduced at the end of Angel Star but played a bigger part in Lemniscate. Nate is dating Teagan’s mom. Well, I’ll let you see what happens with all that when you read it yourself. Overall, an entertaining read! I look forward to reading the next book in the series. Side Note: Most of us don’t believe in vampires, werewolves, wizards, etc, but in this book there are angels and evil spirits. I do believe in God, angels, and evil, but I don’t believe in incarnation or angels as depicted in this book. I just wanted to be clear that I read this book like an entertaining work of fiction. 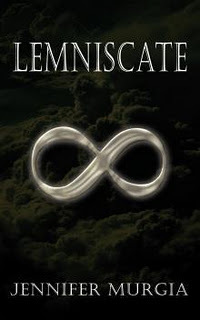 I am giving away a copy of the book, Lemniscate by Jennifer Murgia. Please fill out the form to be entered to win! *Contest open from December 13-19. Closes at 12am CST December 20th. *You will be emailed if you win. You will have 48 hours to respond in order to claim your prize, or a new winner will be chosen. *Open internationally: Mundie Moms International Giveaway Rules apply. Our giveaways are open to our internationally followers when noted, and due to the rising costs in shipping and paying with shipping out of our own pockets, all Internationally winners will need to pay for their shipping costs within 48 hours of receiving our email, before the book/books are shipped. If within 48 hours no payment or contact is made, we will then select another winner (this is valid for all winners outside the US). 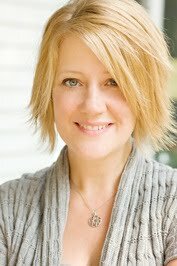 You can follow Jennifer on Twitter and Facebook, and visit her site here. During the duration of the tour, be sure to enter Jennifer Murgia’s Be An Angel, Give A Book Contest. 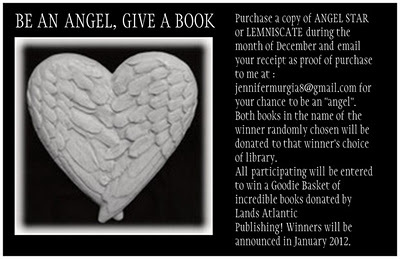 Purchase a copy of Angel Star or Lemniscate during the month of December and email your receipt to jennifermurgia8@gmail.com for your chance to be “an angel”. Both books in the name of the winner randomly chosen will be donated to that winner’s choice of library. ALL those who enter, will be entered to win a Goodie Basket of Lands Atlantic books. That winner will be announced on Jan. 2nd, 2012 on Jennifer’s site.